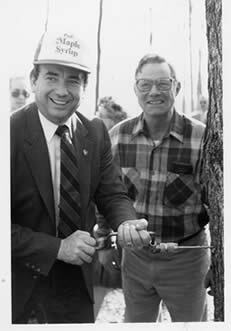 In The spring of 1987, Roland had Wisconsin Governor Tommy Thompson honor the maple industry by officially opening the maple season by tapping the first tree at Jorns' Sugar Bush. We presently can process 600 gallons of raw sap per hour. Sap leaving the tree will be processed into syrup in less than 24 hours, resulting in a high quality, light syrup. Jorns' Sugar Bush serves farm markets, roadside stands, restaurants, and stores throughout the midwest and has shipped syrup to nearly every corner of the world. The Jorns' Sugar Bush factory & store is open year-round. During the sap run, usually from March 1st to April 15th, we invite visitors to come and join in the historic experience of maple syrup making.